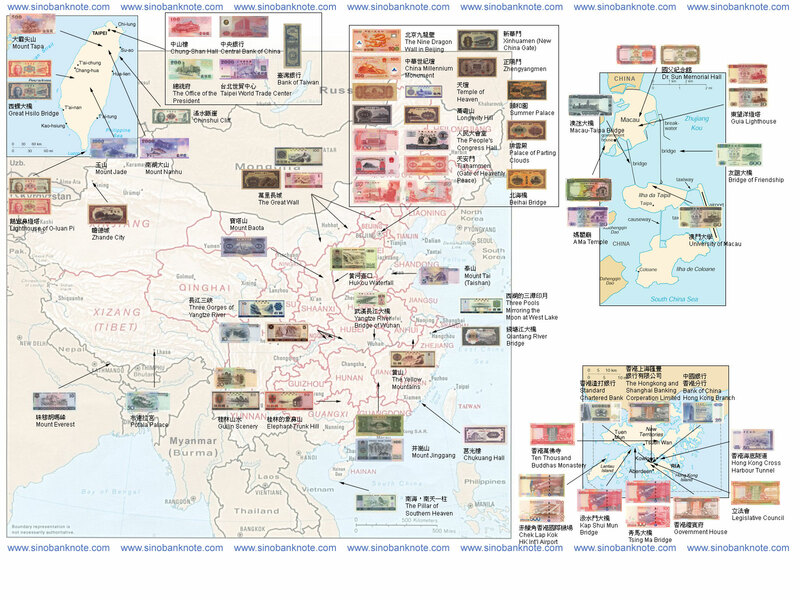 2/27/2003 The banknote map has been corrected. The latest RMB 5 Yuan was missing. 2/20/2003 (Chinese only) Added Story of the Old TWD and individual stories of old TWD notes. 2/19/2003 Correction on the photo of HKD BoC 1000 Dollars, 100 Dollars, and the resolution data of HKD HSBC 500 Dollars, SCB 100 Dollars, 500 Dollars, BoC 100 Dollars, 1000 Dollars. New FAQ entry explaining why I don't use pick number for the first series of RMB. 2/18/2003 Sinobanknote is restored. If you find a broken link of broken image, please contact the webmaster, and you could win a free RMB 1960 series banknote while supply lasts. Updated photo: RMB P891 50 Yuan 1999. Added the first series of RMB. Correspondingly, the banknote map is updated. Added issuance month and date. 2/10/2003 Correction on the starting year of the history of China in the Cathay wallpaper. It was 2600 BCE, now 2697 BCE. 2/4/2003 Correction on the issue year of Old TWD 500 Yuan and Old TWD 100 Yuan dated 1947. The wrong dates were 1946 and 1947 respectively. Now both 1948. Correction on TWD 500 Yuan dated 2000. The wrong issue date was 2001. The filenames are changed accordingly. 1/15/2003 New photos, RMB 5 Yuan, BoC 1000 Dollars. 1/12/2003 New photos, HSBC 500 Dollars, SCB 500 Dollars, BoC 100 Dollars. 12/28/2002 A brief introduction of JPG compression. Preparing the first series of RMB. 12/14/2002 Pictures updated. They look the same, but the JPEG compression options were different. I will talk about this later. New banknote added: Taiwan P1945A 100,000 Yuan 1949, Macau BNU 1999 series, some Macau 50 and 100 Patacas. Old Macau P71 has been re-numbered as P76. Signature table mechanism slightly changed. 12/9/2002 2 New Polls. In regard to the bulletin on 11/5, I am still doing it. 11/5/2002 WARNING!!! I'm working on JPEG optimization now. The resulting files will be 5% smaller than before while quality remains the same. When They are all finished, I will shut down the website for 1 day for upload. 10/5/2002 Updated HKD Government 10 Dollars 2002 photo and dimension. Added detail picture of TWD 10 Yuan 1946 and HKD Government 10 Dollars 2002. Corrected English version of MOP BoC 20 Patacas 1996 obverse primary, HKD BoC 20 Dollars 1994, BoC 1000 Dollars 1994, and BoC 1000 Dollars 2001 reverse primary, HKD HSBC 20 Dollars reverse secondary. Added Taipei World Trade Center for TWD 2000 Yuan obverse secondary. 8/8/2002 D-variation added to TWD 50 Yuan dated 1972. Image updated in September. 7/14/2002 This site features more than 400 images (135MB), yet is not complete. Some are too small, too saturated, or scanned from a catalog. It is expected to have major update in September and October.